Pepco’s (POM: 15.68 -0.11 -0.70%) $1.2 billion Mid-Atlantic Power Pathway (MAPP) transmission project could be delayed due to slower-than-expected load growth. 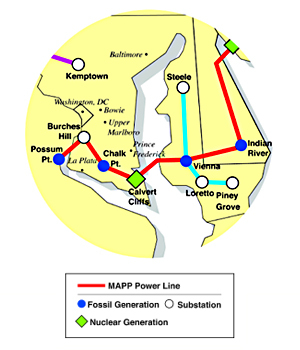 The PJM Interconnection is expected to update the Regional Transmission Expansion Plan (RTEP) in June 2010 and a 1-2 year delay in the project is likely. Pepco Holdings current trailing 12-month earnings multiple is 17.5, compared to the 21.0 average for the peer group and 18.7 for the S&P 500. Over the last five years, the company s shares have traded in a range of 7.4x to 22.6x trailing 12-month earnings. The trailing 12-month EV/EBITDA multiple is slightly above the industry average. Check out their individual reports for other utilities and industries. Let’s hear it for the capital market crash — ain’t the depression grand?!?!?! How bad is it? First the Indian River to Salem leg is cancelled, then the whole thing is suspended… and here we sit… waiting… and we all know that PJM demand is down the toilet. Click here for the last RTEP Mid-Atlantic subcommittee presentation — see if you can download it! The MAPP Office, located at 828 Airpax Road, Suite B700, Cambridge, Md., has adjusted their hours to coincide with the present patronage of the office. The new hours will be Mondays from 9 a.m. to 3 p.m., Wednesdays from 9 a.m. to 1 p.m. and Fridays from 9 a.m. to 1 p.m. Evening hours are available upon request by calling 410-221-6207. Meanwhile, we wait for the RTEP that just won’t come out. How delayed can it get? I guess all that backwards engineering to demonstrate need takes a while, eh? COAL?!?! What are they thinking? How much did the “Partners for Affordable Energy” pay for this? You can find them at www.powerofcoal.com and www.poweringourlives.com. Adding the Bemidji area is a new high-power transmission line from its facilities in North Dakota to Minnesota Power’s power plant at Cohasset. That line is in the permitting process now, and should be completed by 2012, Fee said. Research and development continues into clean-coal technologies for future power plants, say industry officials. Meanwhile, as environmental movements have stalled new coal plant construction, utilities will depend during the next 10 years more on natural gas-fired peaking plants, such as the second one planned at Solway, and wind generation. “There has to be something for baseload generation – 24-hour power,” says Steve Van Dyke, spokesman for Partners for Affordable Energy, an industry coalition that supports the use of coal for energy production. Time to trot out the “Carbon Capture & Storage” red herring again(and check those teeth, how bizarre!). Yet another study out that shows that Carbon Capture ain’t happenin’ and we’d best be dealing with the problem and not pretending like CCS will save us. The carbon sequestration pathway presented here posits great human effort in the next two hundred years but subsequent human inaction in the spirit of `out of sight, out of mind’. Alternatively, long-term leakage from the ocean or geological reservoirs could be actively countered by resequestration to stabilize climate at some desired level. However, there are serious concerns connected withthis. First, it would be difficult to gauge the global leakage rate that would have to be matched by the resequestration rate. Long-term monitoring of atmospheric CO2 concentrations would probably be the best way to address this but natural carbon-cycle fluctuations would complicate this approach. Second, resequestration would have to be carried out over many thousands of years, a burden for future society not unlike that of long-term management of nuclear waste. By greatly limiting carbon emissions in our time, we could reduce the need for massive CO2 sequestration and thus reduce unwanted consequences and burdens over many future generations from the leakage of sequestered CO2. Rich countries have earmarked tens of billions of dollars of investment in carbon capture and storage (CCS), a technology that is still only at an experimental stage. The STrib had posted a thoughtful, balanced piece about the problems with “biomass,” actually discussing some of the problems with biomass — and biomass is a burning issue here in Minnesota. And then, with the blink of an eye, it’s GONE… GONE… GONE! GREENFIELD, Mass. — Matthew Wolfe, an energy developer with plans to turn tree branches and other woody debris into electric power, sees himself as a positive force in the effort to wean his state off of planet-warming fossil fuels. In fact, power generated by burning wood, plants and other organic material, which makes up 50 percent of all renewable energy produced in the United States, according to federal statistics, is facing increased scrutiny and opposition. 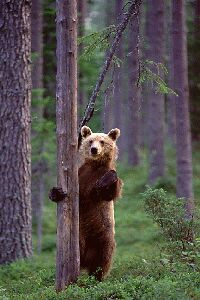 That, critics say, is because it is not as climate-friendly as once thought, and the pollution it causes in the short run may outweigh its long-term benefits.